Are you ready to develop the financial reporting (SEC Reporting) process for a newly public company? Are you ready to do some of the best work of your career? This role will report directly to the Corporate Controller and will have frequent interactions with all executives at the organization. This is a highly visible role with the opportunity for advancement within the organization. Interested? Let’s have a CONFIDENTIAL conversation. 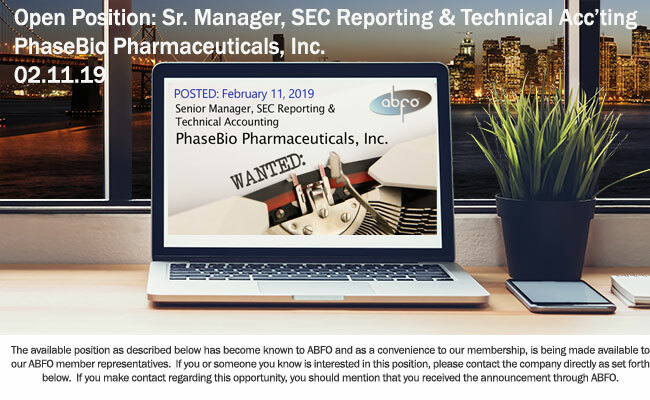 PhaseBio just completed its IPO in October 2018 and is well poised to be a leader in its field. PhaseBio is a well-funded, San Diego based life sciences company that is developing potentially life-saving drugs focused around the body’s hardest working muscle: the heart. With two distinct drug candidates in the pipeline, we hope to pursue two separate development pathways. Additionally, we have the potential to develop additional drugs in the near future. You would be working out of our corporate office located in Carmel Valley. We expect to grow the accounting function over the coming months with the goal of creating a world-class team. Once you are part of this team, the processes will be for us to develop and own. This is an amazing opportunity to put your mark on a company and help it grow from a newly public company to a, hopefully, commercial organization.